We know the importance of looking stylish on holiday and that’s why we bring you the best selection of Ash sandals each summer to take the stress away from holiday dressing. 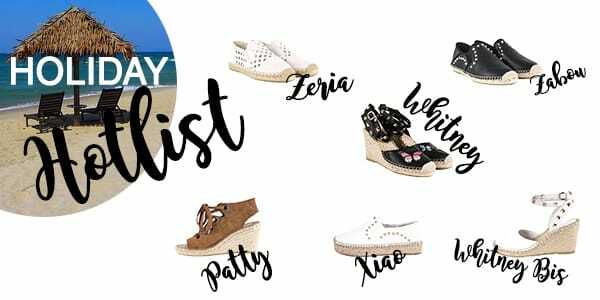 Espadrilles were made for sun and sand and this season we have a huge selection to complete your holiday wardrobe. From flats to wedges in leather, suede and canvas, we are really spoiling you. When the weather heats up there is nothing better than white against bronzed skin. For a lighter option, look to the canvas Zeria in off white for an easy pool and beach side slip on. For city strolling, the Xiao in white leather will be perfect teamed with cut off denim and an off the shoulder number. For evening, team a light floaty dress with the Whitney Bis wedges for laid back holiday style. Moving away from bright white, if darker colours are more your thing, the Patty wedges will provide a little height whilst nodding to the eyelet trend that is coming through for this season. Another trend that you can take on with our Whitney wedges is embroidery – The butterfly detail on this style will inject a little femininity into your look and can be worn day to night. Not feeling heels? The Zabou slip ons are our top pick and can also double as this seasons must have mule style by simply folding down the back panel. With so many options, your holiday shopping is made easy at Ash this summer. Easy day to night options mean packing light doesn’t seem so daunting any more! Shop Ash espadrilles here.